Today I have a wedding card that was made with white cardstock and some pre-embossed silvery-grey cardstock I've had for a while. I first cut the Bloomin' Heart with a die from SU! 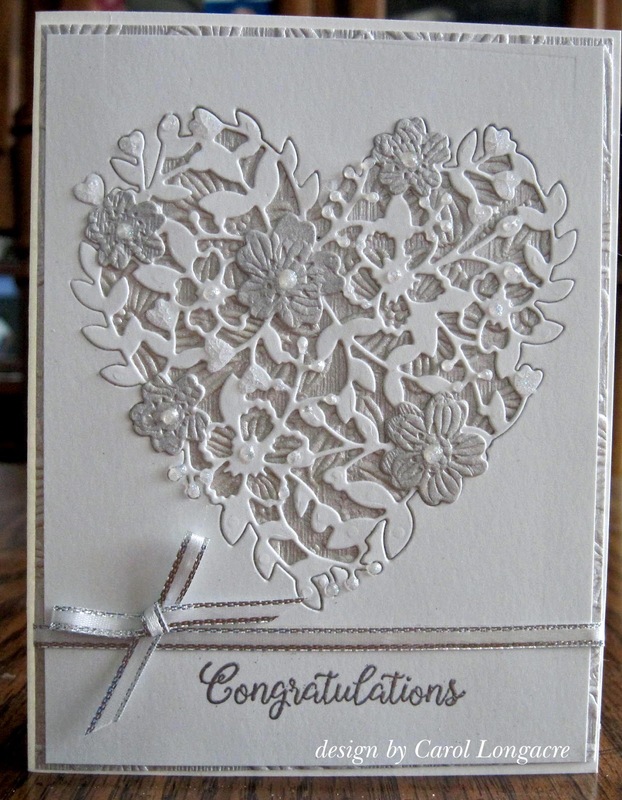 from the white cardstock panel, then matted it with the embossed dsp, leaving a little bit showing around the outside edges for contrast, and then placed the die-cut heart back into the opening. I die-cut several of the flowers from the embossed dsp, adding them to the front along with some liquid pearls. The sentiment was heat-embossed with silver ep and I found a snippet of narrow silver-edged satin ribbon I used to create a border and a tiny bow. I'm sharing this with the Simon Says Stamp Wednesday challenge which is to make an Anniversary or Wedding card. Thanks for stopping by and I hope your Friday is a great one! Wow, so classy looking. This is a beautiful card. Hugs Mrs A. Beautiful card, Carol. White on white is always so elegant. Very elegant wedding card that I'm sure any couple would treasure forever and ever. Love this! SO elegant and very beautiful, love teh silver and white. A beautiful card Carol, a fabulous die and elegant design. Wow wow wow!!! Such amazing wedding card you made, Carol!!! Love so much this die-cut heart, it's really outstanding on that negative panel and the silver embossed flowers add a lot of dimension! White and silver are a great combo and the satin bow is just delicious! Very classy!! This is so gorgeous and elegant looking. Elegant and pretty, looks high class without breaking the bank. Gorgeous card Carol! It's so elegant and pretty.